The proposed amendment to the EU Gas Directive aims to extend EU Internal Gas Market legislation to import pipelines from third countries. This would mean imposing third-party access, ownership unbundling, transparency and EU-regulated tariffs on infrastructure outside the boundaries of the internal market, for example, due to entering the EU from international waters. As a consequence, a number of intergovernmental agreements (IGAs) will have to be negotiated, or renegotiated with third-country governments. There is some concern among affected Member States that the need for new or renegotiated IGAs, because of the amendment, could shift powers of negotiation from them to the European Commission. It is not clear which conditions will apply to existing or new pipelines. Many factors indicate that the aim of this proposed regulatory change has the Nord Stream 2 project as its main target, rather than other existing or new import pipelines. However, this does not rule out that there may be consequences for other infrastructure too. There are currently five international export pipelines entering the EU gas market by sea (Transmed, MEG, Medgaz, Greenstream and Nord Stream) that will be affected by the proposed amendment, with two more (TAP/TANAP) and (Nord Stream 2) being under construction, to be taken into operation soon . The five in place will be handled as existing pieces of infrastructure, potentially to receive a derogation from the amendment. An additional, important future pipeline project that could also be affected is the planned pipeline from Israel via Cyprus to Greece (East Med)3 .The third-country suppliers or transit nations involved vary greatly in their upstream regulation, political stability, interests, attitudes towards each other, and in their general inclinations towards the liberalized EU gas market and the conditions it wishes to impose. There is also great variation as to when these pipelines were constructed and taken into operation – some pre-date even the first Gas Directive. The requirement for new or renegotiated IGAs is not without risk. Third-country governments may not be comfortable about having EU regulation extended to their doorsteps, and may make counter demands. Various geopolitical factors may have changed since the pipelines began operations, and this may influence negotiations. Many of the affected pipeline projects were planned, negotiated and constructed under very different political circumstances. Opening up for new negotiations in today’s environment risks creating new uncertainties which may carry unforeseen, possibly negative consequences. In this paper, we will review each of the affected pipelines, and discuss to what extent such risks or other complications exist. This report is a supplement to a previous report, “Analysis of the proposed gas directive amendment”, that was published in March 2018. The work has been commissioned by Nord Stream 2. The countries of the European Union have imported gas from third countries for a long time. The first imports of gas came to the UK from Algeria in the 1960s in the form of LNG. During the 1970s, large-scale imports from Russia to Western Europe began, delivering gas from Siberian fields via onshore pipelines. Norway began deliveries in 1977 from the Ekofisk field to Germany, Belgium and France. The first major subsea export pipeline constructed across the Mediterranean was Transmed, bringing Algerian gas to Italy via Tunisia from 1983. 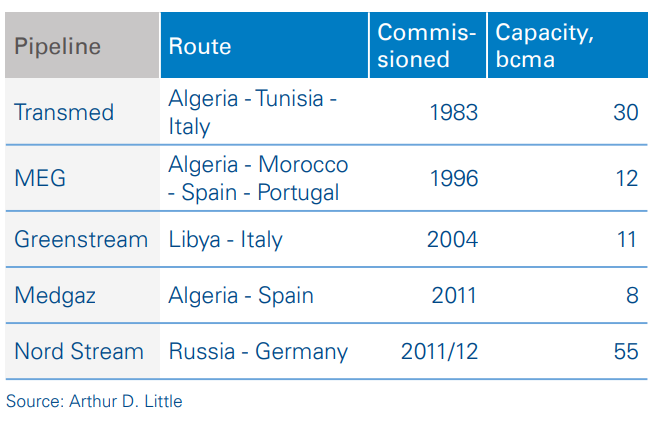 Prior to that, Algerian gas had been exported only as LNG. Transmed was followed in 1996 by MEG – the Maghreb-Europe gas pipeline - from Algeria via Morocco to Spain. In 2004, Greenstream, from Libya to Italy, was commissioned. Medgaz from Algeria to Spain and Nord Stream from Russia to Germany followed in 2011 and 2011/12 respectively. In all cases of international pipeline projects, especially the ones involving third-country exporters, there was substantial initial time involved in planning and negotiations before construction could start. In most cases, supplier, transit and buyer governments were all heavily involved. In some cases, construction could not begin for years, or was interrupted midway, due to a variety of political tensions.